Jenn Balcer | A little bit about me and some of the things I love. A bunch of us are celebrating the fantasmagorical Julie Ebersole‘s 50th birthday with a little blog hop – it started in the CLASSroom – Ellen Hutson and Lisa Strahl and when you leave here, you’ll want to click over to visit Jennifer McGuire Ink – Jennifer McGuire for more birthday love for Julie. 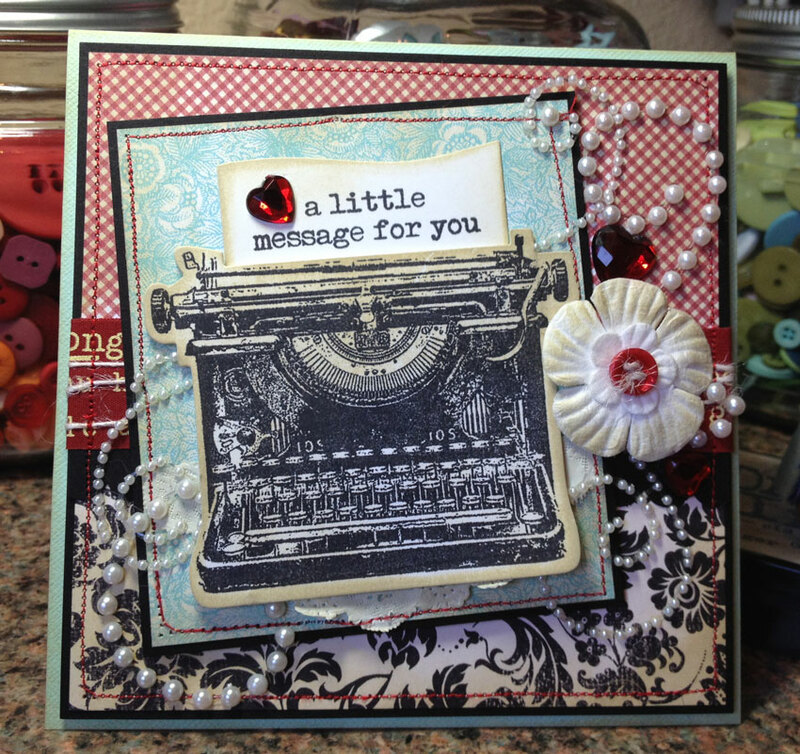 My card is simple – lots of clean lines, a little bit of baker’s twine, a few embellishments . . . something totally inspired by my dear friend, and a card I saw in the same colors when we visited Paper Source (and a few other papercrafty places, too, naturally!) in Seattle a few years back. What. A. Fabulous. Weekend. Lots of laughs, lots of good times! Every moment I’ve spent with Julie since we first talked on the phone a jillion years ago is a treasure, as is our friendship. We’ve been through a lot together, and I’m so very grateful she’s a part of my life. Julie, I hope you’re blessed with many, many more happy birthdays. I love you! Busy life has taken over the past week or so (again) and I’ve been swamped with work and running around with kids and for work and it was nice to take a few minutes to make a cute little card with Spellbinders dies – this week’s Crafty Friends Challenge (from Nina!). Three dies, some paper from the My Mind’s Eye Lost & Found TWO collection (blush), and the matching stamps – it came together very quickly! 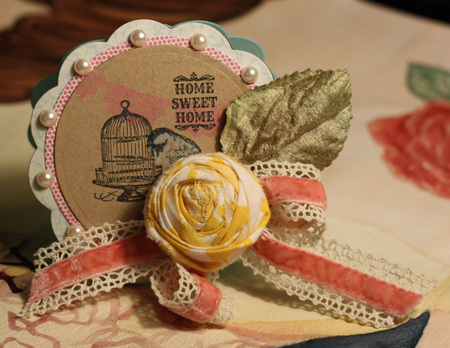 The pearls and velvet ribbon are from my stash, as well as the pretty lace and velvet May Arts ribbon. The fabric rose came on a package from Erin (gee, she’s really on my mind lately, I think!) at Vintage Glam. I save all the pretties she sends her packages in for “someday” and I’m glad “someday” came! Hope you’re all enjoying life and getting crafty! I have company coming over tonight for Pioneer Woman’s big fat bacon sliders. Mmmm, can’t wait! Hey, y’all! It’s been a while. A long, long while. So much has gone on in the last several months in my life, and it’s been fun and challenging and exhausting, and I’ve missed two things sosososososo much. 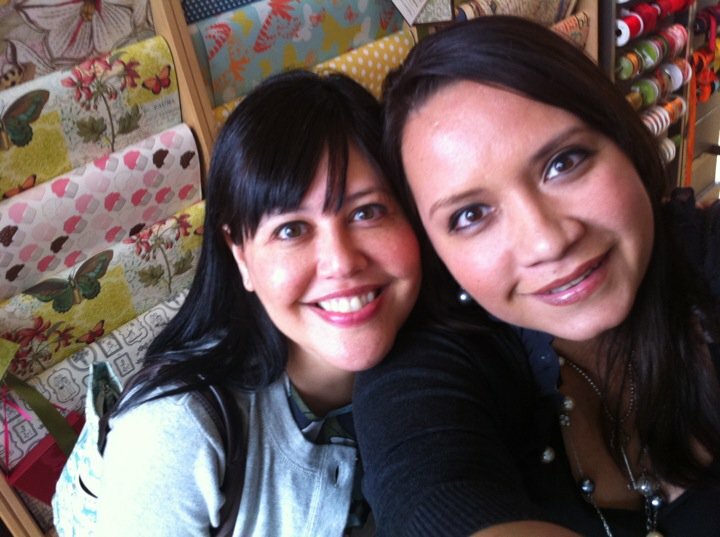 Creating and my crafty friends. I’ve missed that alotalotalot. This little vintage-y card is made of things dug out of my stash. A little doily from a recent order I received from Erin at Vintage Glam, some Prima flowers and bling, 7 gypsies paper, and stamps and coordinating dies from My Favorite Things. I’m a little bit a whole lot in love with the finished card. Thanks for coming by and visiting again! Please make sure to visit the Crafty Friends blog and follow along – we’ll be back every two weeks with a new challenge to share with you!